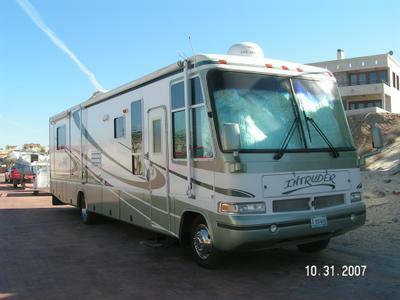 We are anxiously awaiting the arrival of our new-to-us motorhome. It is a 2001 Damon Intruder with two slides. We purchased it sight unseen so we are, needless to say, a little anxious to see it. We expect it to be mechanically fit but a fixer-upper on the inside and we have lots of plans to personalize our living space. She will need a name - any suggestions? She (why are vehicles always “she”?) is from North Carolina. The person we purchased it from specializes in purchasing vehicles and boats in the US and importing them into Canada for resale, usually in Newfoundland. We checked his references and are confident he knows what he is doing and is honest and knowledgeable – as he says “If he ever screwed a Newfoundlander he would never do business in that province again”. We told him what we are looking for, OKed the selection and made a substantial deposit. He is flying down this morning to pick it up and expects to have it ready for delivery in Halifax this Friday. It will be “Canadianized” (daytime running lights, etc.”) and receive its MVI sticker (a Nova Scotia safety certification) before we take possession of it and the seller will stay in NS for the weekend to familiarize us with it. He has a brother in Bedford. Then he is off to Newfoundland and we are on our own. In the meantime we are anxiously waiting with fingers and toes crossed. Wish us luck! Welcome to new followers Deborah and Phil of Seemed Like a Good Idea. I see you are fairly new to full-time RVing as well so we will follow your adventures with interest. Oh My! Its a Big Motor Home! 30 cm Snow in Nova Scotia? ?